Three whole weeks old and I can already see so many changes in my baby boys. I suppose to everyone else they still seem the same but everyday is just a little bit different as we learn a bit more about them. I love seeing them in their alert and awake moments as they look around and take everything in. This week has been the last week of my husband’s paternity leave so we have made the most of all being together before the madness truly begins! We don’t have another health visitor visit for a couple of weeks but I can tell they have both put plenty of weight on and they seem quite content and happy. They are both sleeping so well for the most part I almost don’t want to write it down in case it jinxes us! They feed every three hours through the night but nearly always will go straight back down to sleep after a feed; to me this seems miraculous as it was most definitely not the case with Lucas. 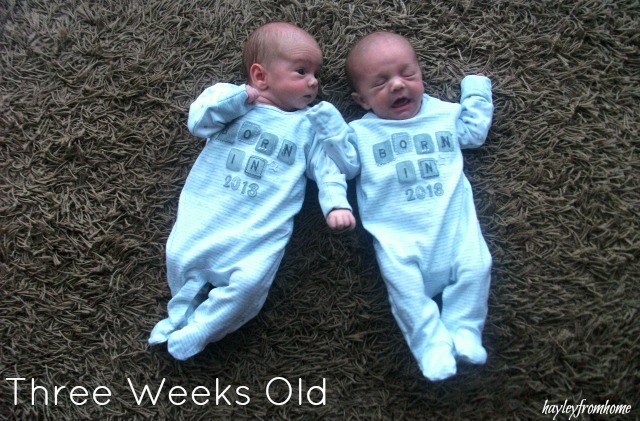 It sounds a but strange but sometimes I can’t quite believe I have two newborn babies! When I look at them sleeping together I feel so lucky to have two little boys. I know we are still in the honeymoon period while my husband is off work and everything will change again but they’ve fit into our family perfectly and I wouldn’t have it any other way.